The Rebel Sweetheart. 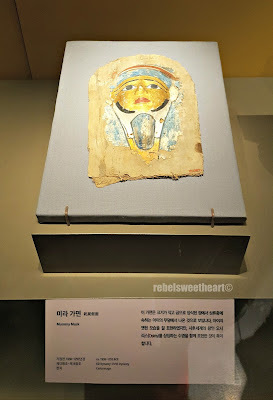 : Seoul Searching | Egyptian Treasures from the Brooklyn Museum: Special Exhibition at the National Museum of Korea. 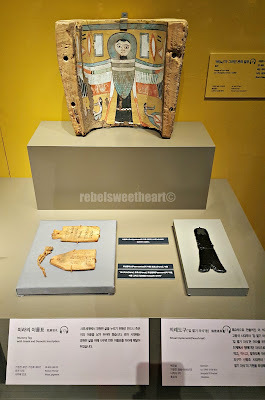 Seoul Searching | Egyptian Treasures from the Brooklyn Museum: Special Exhibition at the National Museum of Korea. 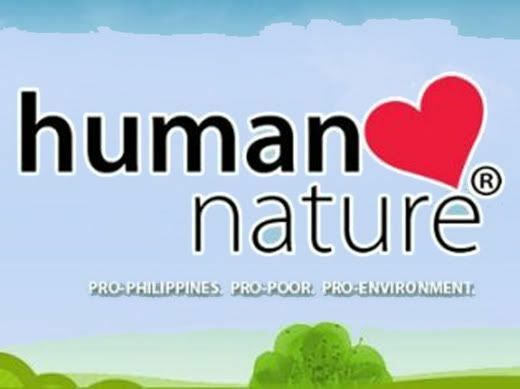 Happy New Year everyone, and we're sort-of back to regular programming! 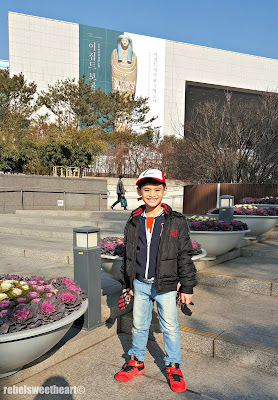 I'm still blogging from South Korea, though we have only a few more days left here. Although the feeling is not exactly new to me, I can't help but feel a bit sad and anxious now that our vacation is about to come to an end. 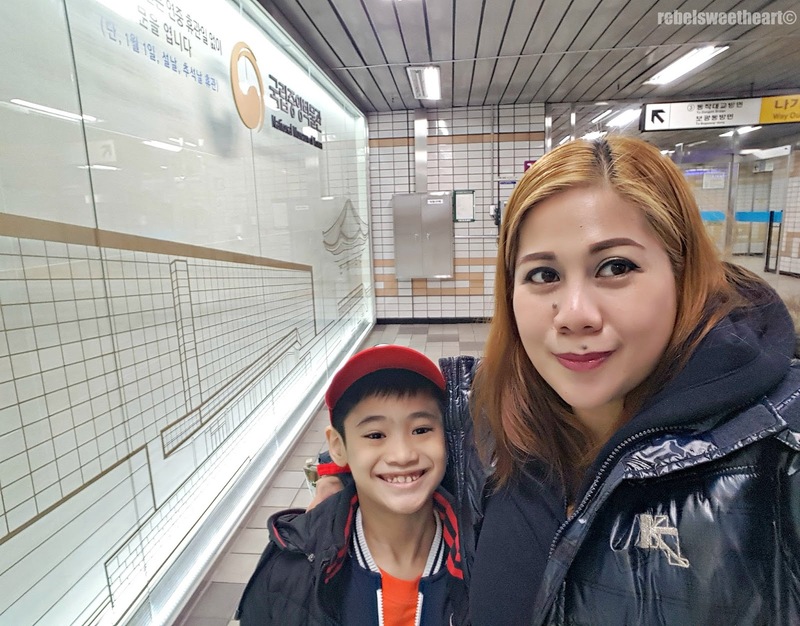 I can already feel the sepanx kicking in; so much so that I'm actually searching for cheap plane tickets for Spring as I write. Anyway, back to happier thoughts. 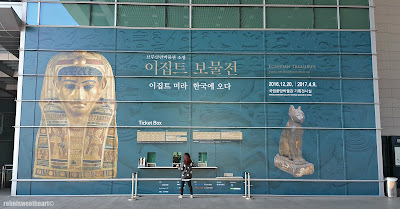 A few days after we arrived in Seoul, I chanced upon a post on Facebook about Egyptian treasures coming to town. 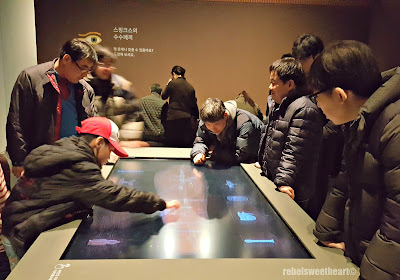 And so I checked the official websites of some of the museums here that I know, until I came across the announcement on the National Museum of Korea's official Facebook page. 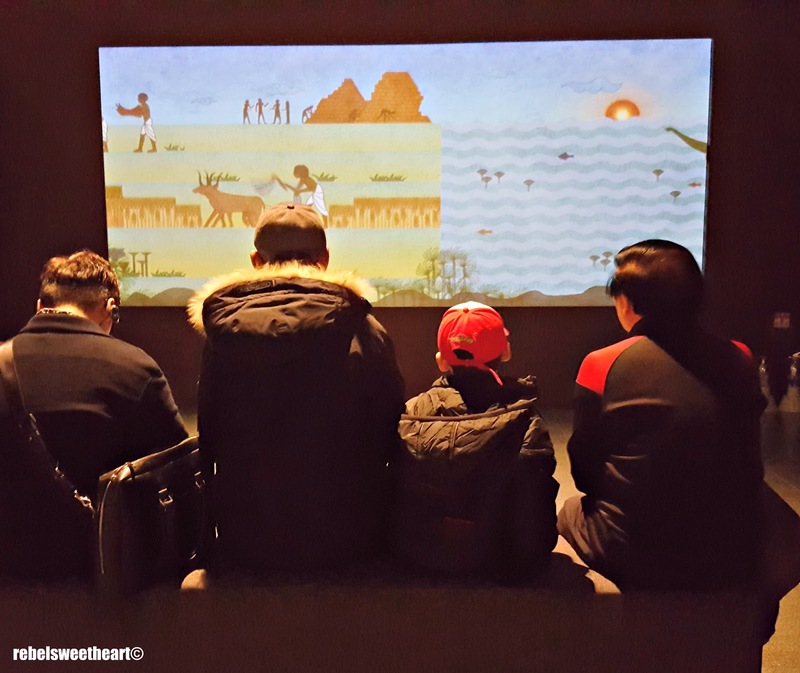 True enough, a special exhibition was to be held starting on the 20th of December. 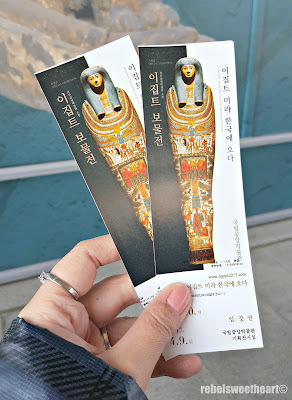 Although the post did not mention anything about the admission fees, I figured the tickets wouldn't cost me an arm and leg (fingers crossed), haha. 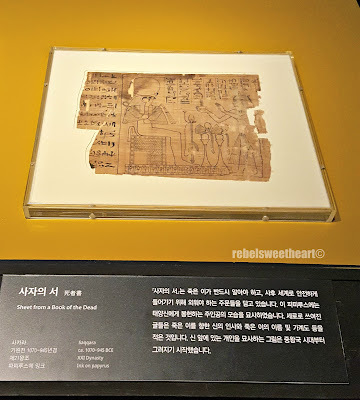 And so Yue and I trooped to the National Museum of Korea on the 20th, eager to catch the Egyptian Treasures exhibition on its opening day. We took the subway to Ichon Station, which is connected to the subway via an underpass called the 'Moving Museum'. 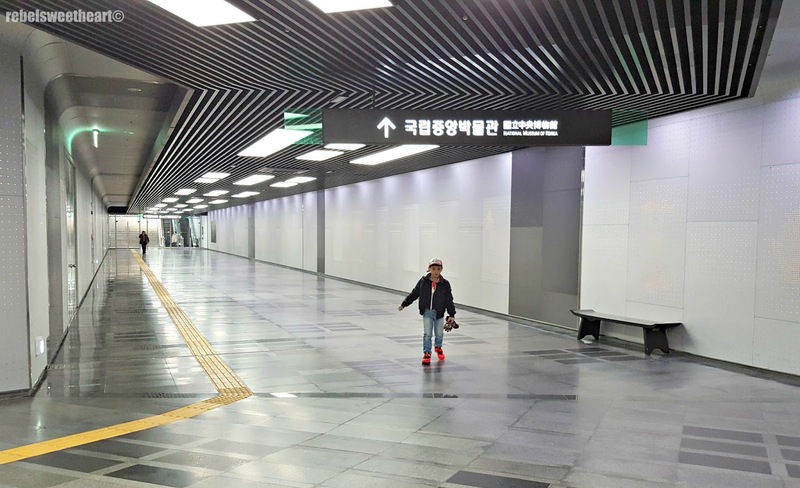 This is the first thing we saw as soon as we 'tapped out' of the subway. One of the very few instances that you'll see me in the photo, haha! The underpass which connects the subway station and the museum. Almost there! The door at the far end of the corridor leads to the entrance to the museum grounds. How can we not miss the poster for the Egyptian Treasures exhibition? The tarpaulin was huge enough to cover one side of the Special Exhibition Hall. 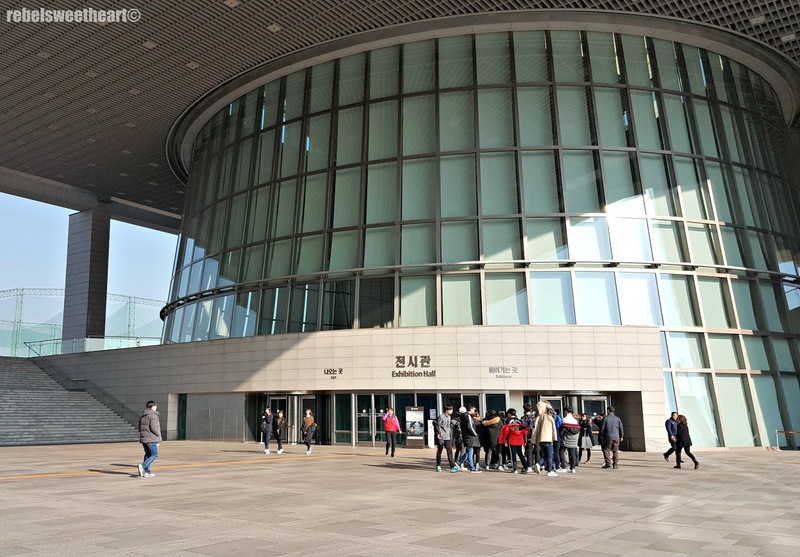 The stairs leading to the Exhibition Halls. The Great Hall, where most of the permanent exhibitions are displayed. 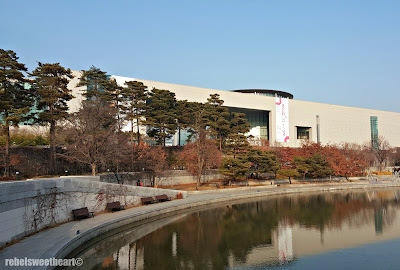 Entrance to these exhibitions are usually free. 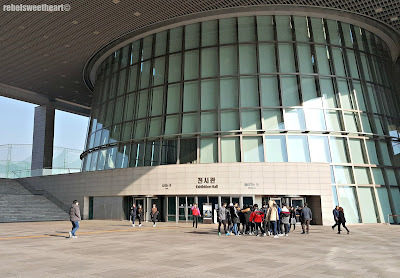 We purchased tickets before entering the Special Exhibition Hall. 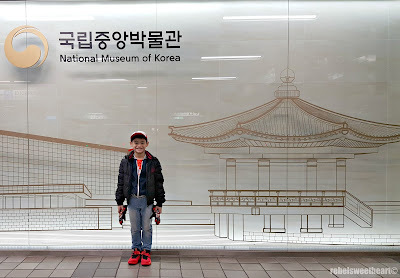 Admission rates are 13000 won (around Php 530) for adults and 8000 won (around Php 330) won for kids. Barely Php 1000 for two tickets to a once-in-a-lifetime to see these Egyptian artifacts up close, I'd say that's a steal! Admission rates, please click to zoom. Our tickets, which counts as a souvenir. 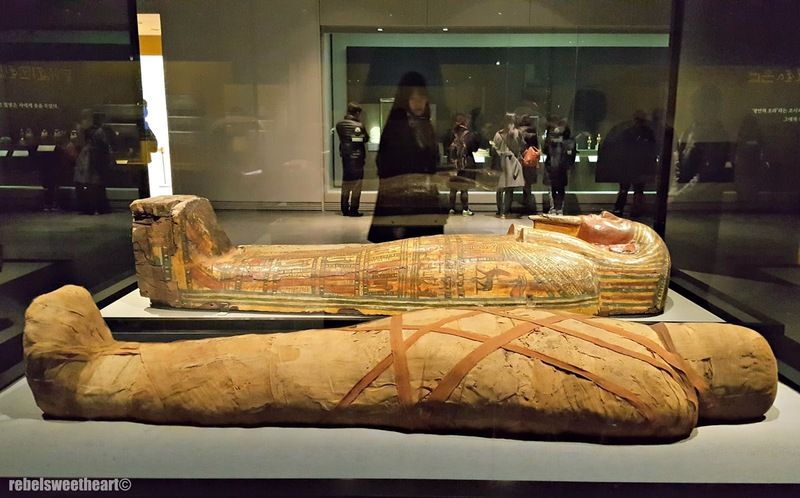 View the Egyptian Treasures after the jump! In collaboration with the Brooklyn Museum in New York, this special exhibition features more than 200 objects from the ancient Egypt collection, one of the well-known collections of the said museum. To the exhibition we go! 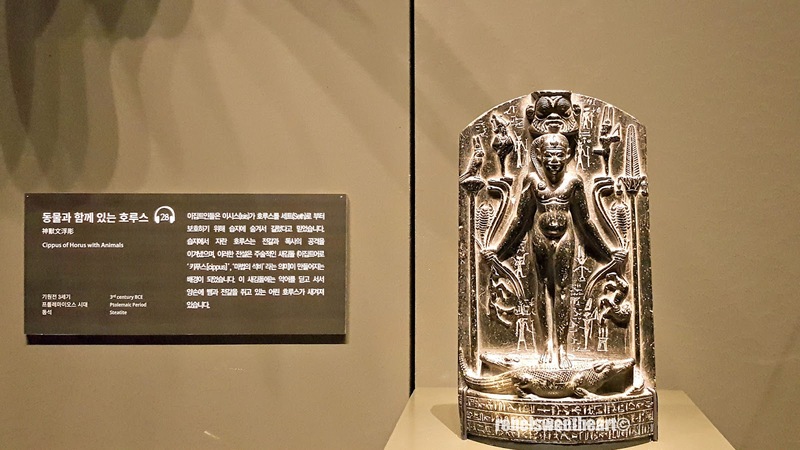 The exhibit starts with an introduction to the ancient Egyptians' belief in the afterlife, and the family tree of the most important gods of the ancient Egypt pantheon. 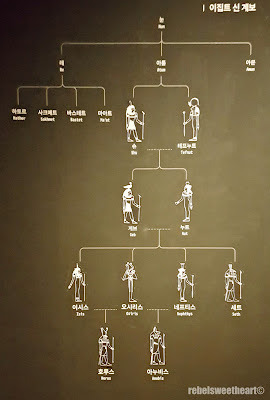 The family tree, starting from Nun - the first god. 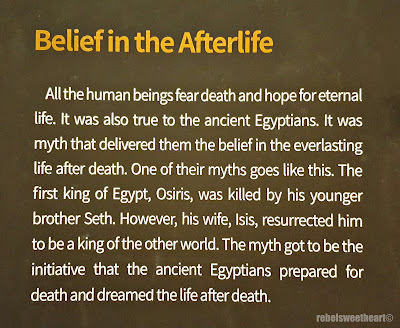 Legend has it that Osiris, the first king of Egypt, was murdered by his own brother Set. 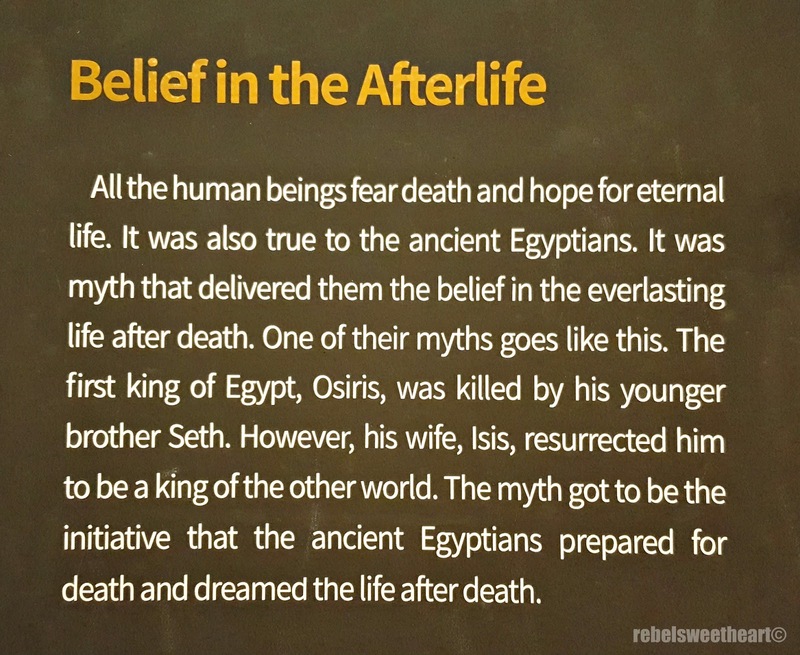 Osiris' wife, Isis resurrected her husband's body and transformed him into the god of the afterlife, the underworld, and the dead. 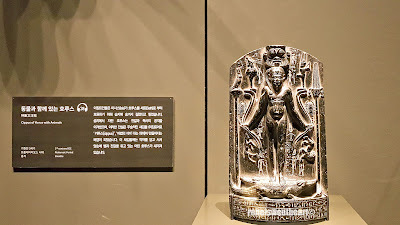 Henceforth, Osiris became the judge of the dead of the afterlife and made decisions as to whether a soul can enter his kingdom and enjoy eternal life. As such, ancient Egyptians spent their lives planning their funerals for this final day of judgment, eagerly anticipating the days of eternal glory. 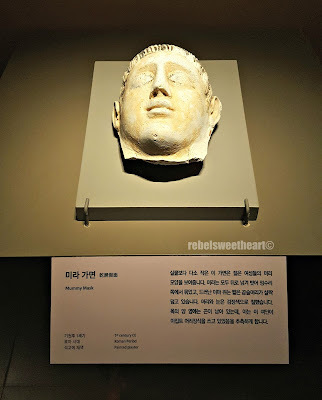 Mummy Mask from the 2nd century. Mummy Mask from the 1st century. Cartonnage of a mummy mask. 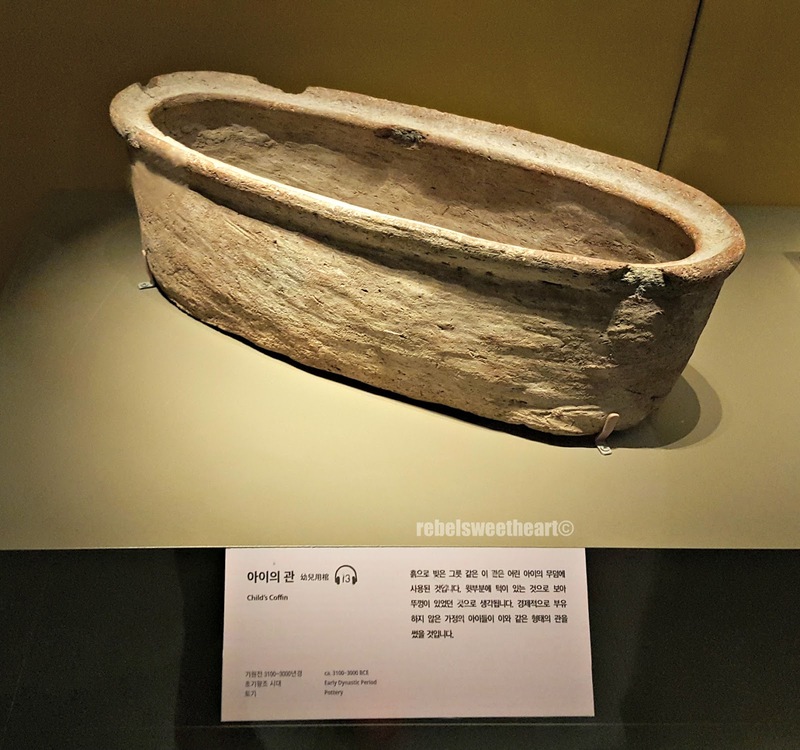 Everyone from the ancient kingdom - peasants, noblemen, and royals alike - made preparations for the afterlife, mummifying the deceased and carrying out elaborate funerary rituals. 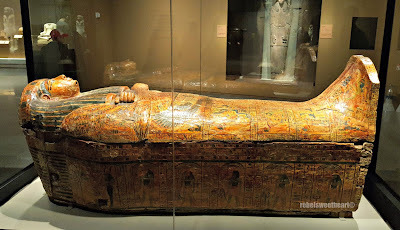 The wealthy adorned their coffins with gold and jewels, while regular citizens made do with ordinary ornaments or gilt, a paint similar to gold. 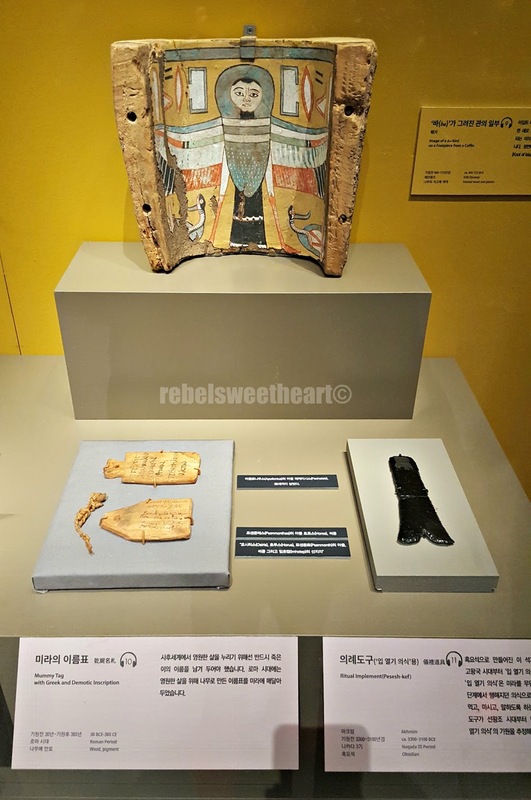 Mummy tags and ritual implements. 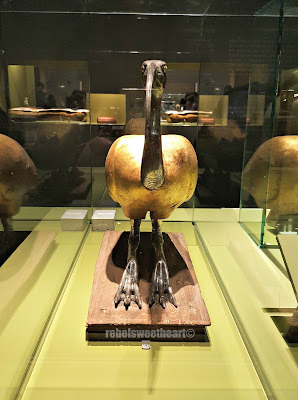 Canopic jars used for storing organs. We had the chance to see such funerary accessories at the exhibit, from coffins to shrouds, to mummy tags and mummy masks. 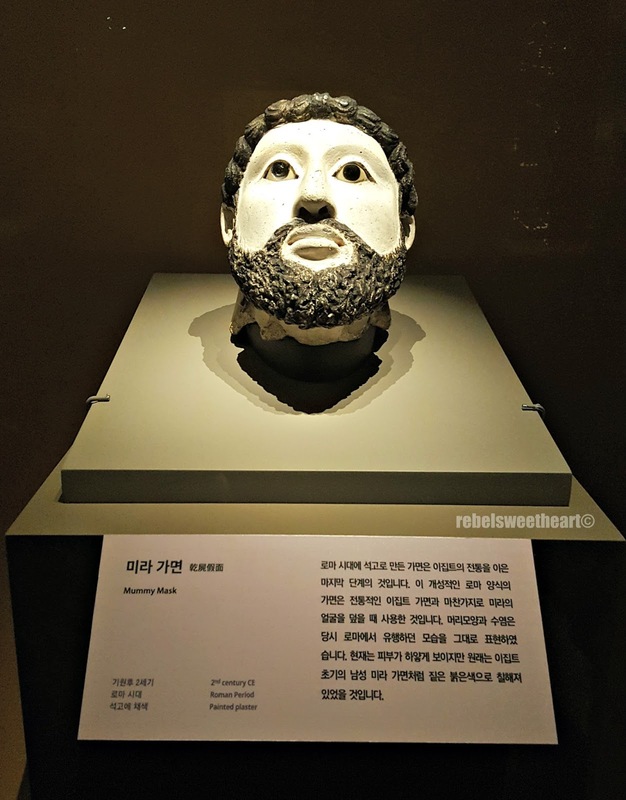 We also saw a few pages from the Book of the Dead, cremation tools, and even shapty dolls that were believed to become servants for the deceased in the afterlife. 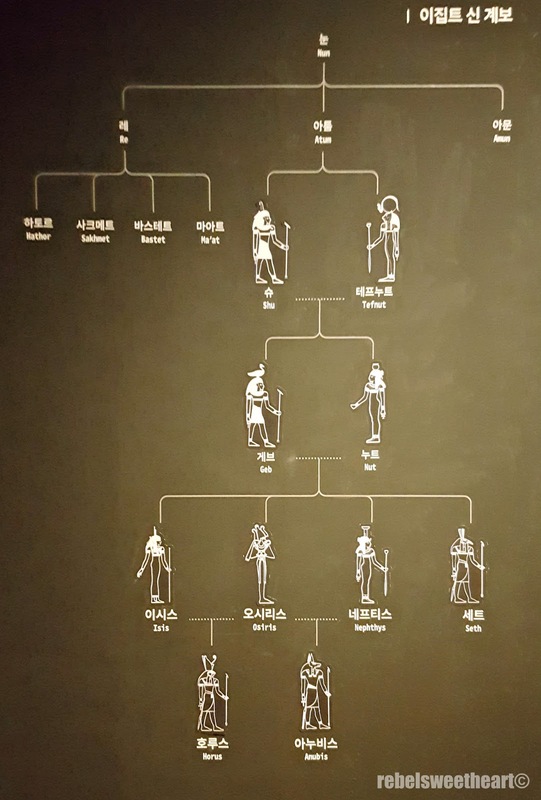 A sheet from a Book of the Dead. One of the highlights of this exhibit is Thothirdes, a mummy that dates back to the 26th dynasty. 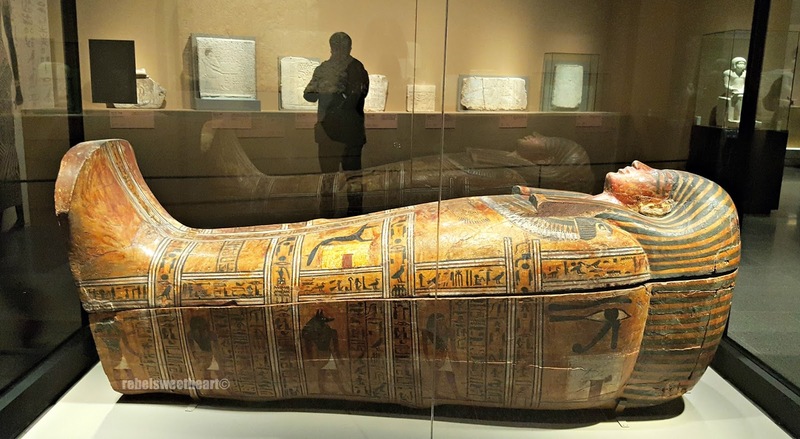 From what I know, this mummy is one of the 11 human mummies in the Brooklyn Museum who are well-preserved and have undergone CT scan for further studies and examination. 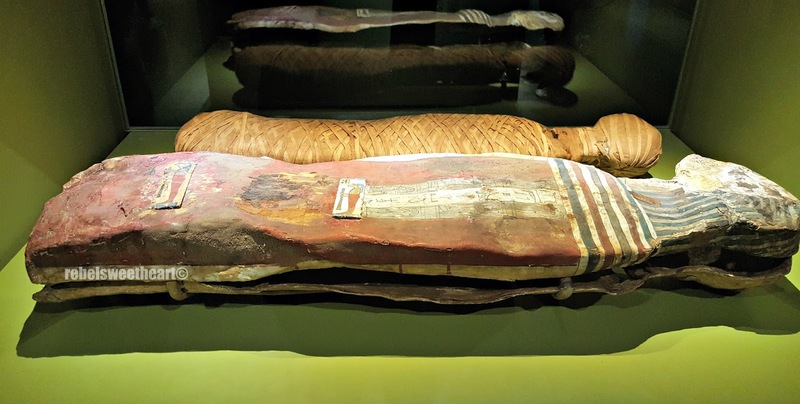 Anthropoid coffin and the mummy of Thothirdes. 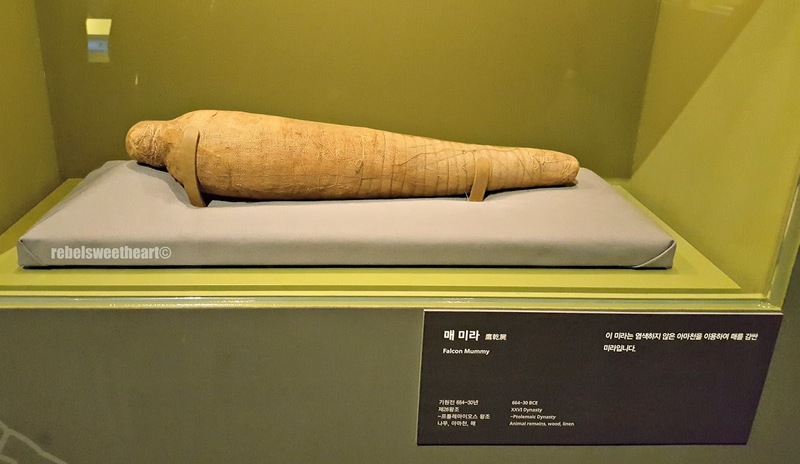 A mummy, sealed in bandages! Seeing a real-life mummy up close and personal was such a unique, eerie, and surreal experience that will be etched in my memory forever! I bet my son feels the same fascination as I do! Inner cartonnage of Gautseshenu, who dates from the 700 BCE. 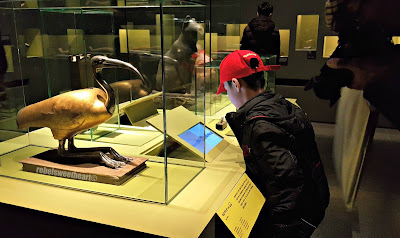 Also showcased in this exhibit are mummified animals that offer a glimpse of the ancient practice of animal worship. 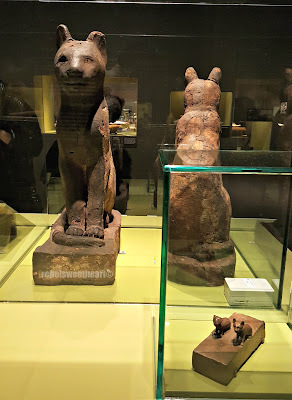 The ancient Egyptians believed that animals have been created together with human beings, and that animals would protect them like gods. 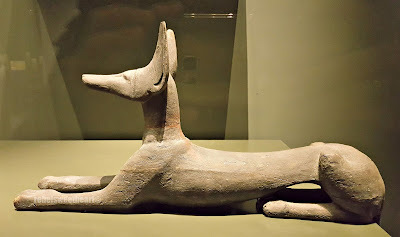 The ancient Egyptians also believed that like humans, animals will also be bestowed with eternal life. 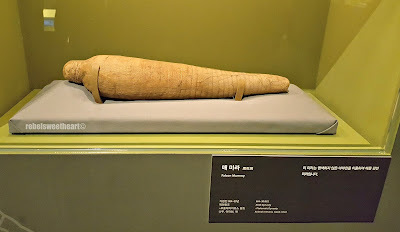 Animal mummies are unique cultural heritage of Egypt among the ancient civilizations. 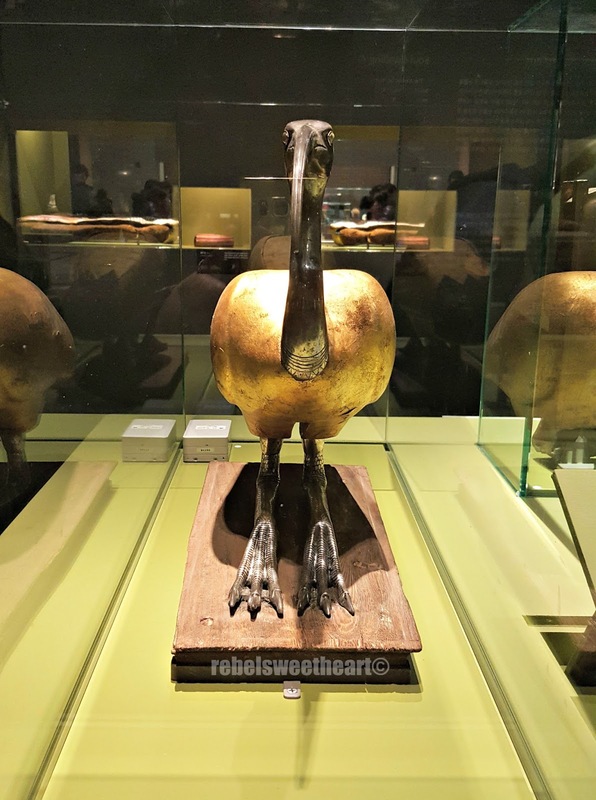 If the ancient Egyptians regarded animals as mere foodstuff or inferior to human beings, they were never made animal mummies. 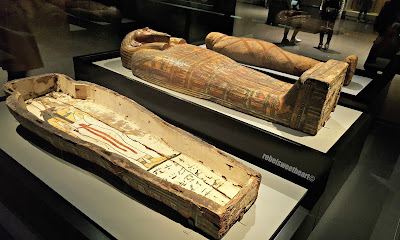 Cartonnage of a cat mummy. Tens of millions of animal mummies discovered until now indicate that the ancient Egyptians treated their animals with utmost respect, as they believe that these animals act as messengers of their earnest wishes to the gods in their behalf. 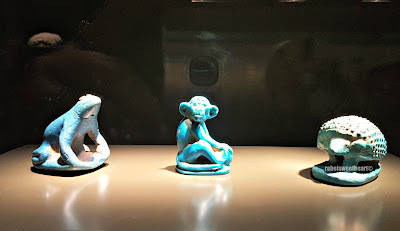 Frogs symbolize fertility, monkeys represent wealth, hedgehogs stand for resurrection. My curious cat inspecting the cat coffins. Aside from the displays, the exhibit also showcased interactive games and audio visuals for the visitors to enjoy. 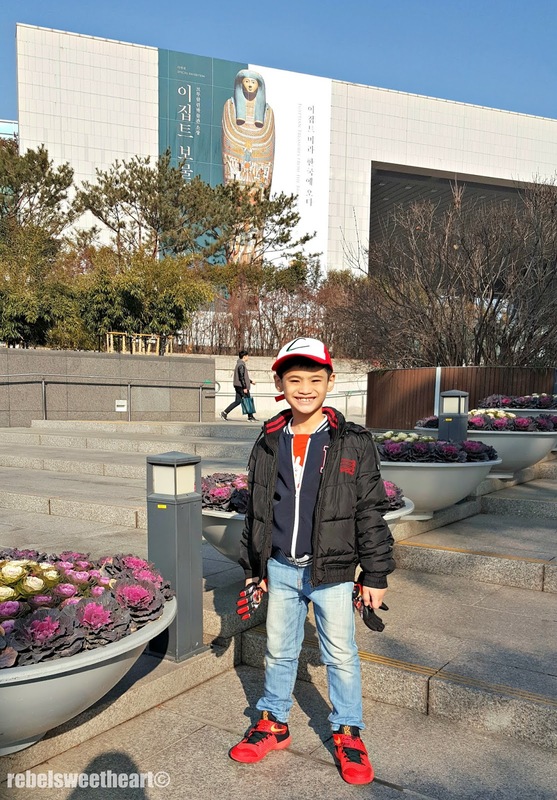 Yue had fun playing games and watching animated films despite the language barrier. Yue playing with some ahjussis. Watching an animated film with ahjussis (again). Trying to answer a quiz app even if the text are in Hangul, haha. Of course, we did not miss the chance to pick up some souvenirs of this special exhibition. 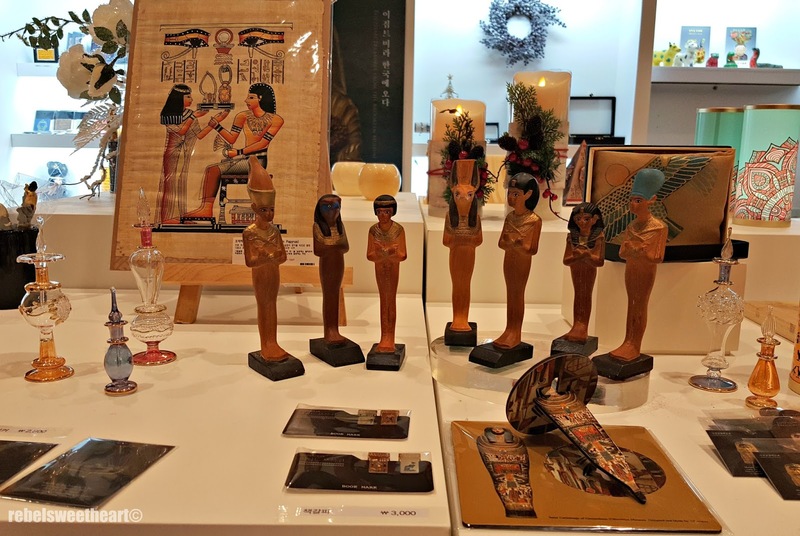 The souvenir shop located at the lobby of the Special Exhibition Hall sells a variety of Egyptian-themed items - from bookmarks to puzzles, to jewelries and scarves. I bought fridge magnets at 5000 won (around Php 200) each. They'd make a nice addition to my collection back home in the Phi. 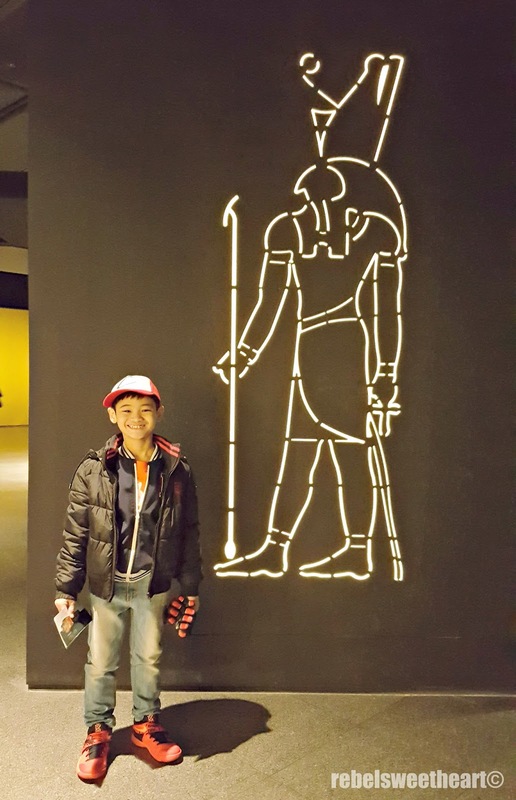 The Egyptian Treasures exhibition will run until April 9, 2017. The museum is open daily from 9 am to 6pm, except January 1st, the Lunar New Year's Day, and Chuseok (Korean Thanksgiving Day). 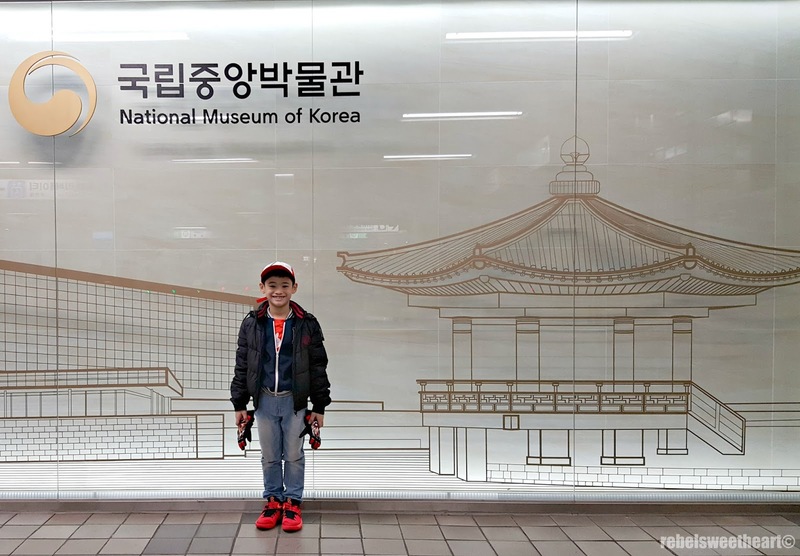 Someone enjoyed his trip to the museum! 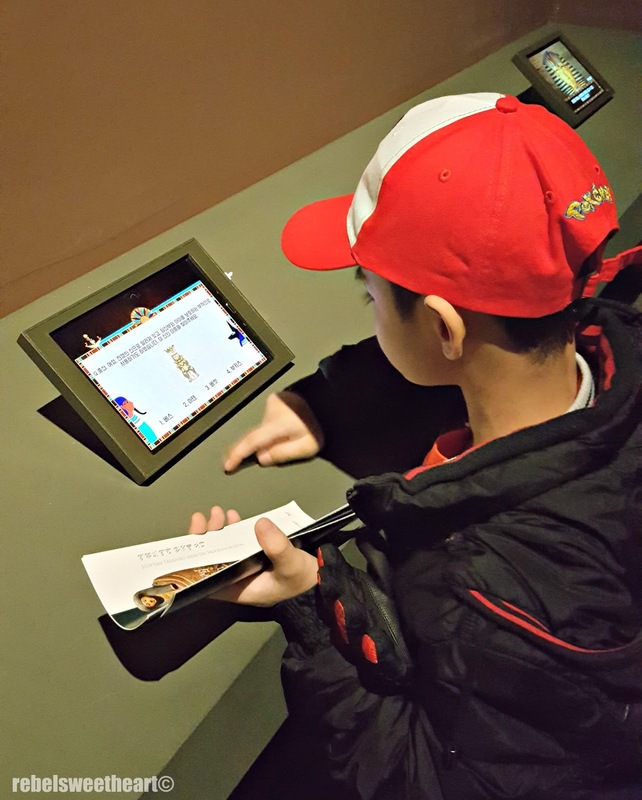 Wow, looks like the museum was FILLED with things to do! I always feel like I need a couple days to really explore all the different exhibits. One day doesn't do justice! The interactive games and audio visuals seem like they'd be a hit for the younger kiddos! Looks fun! 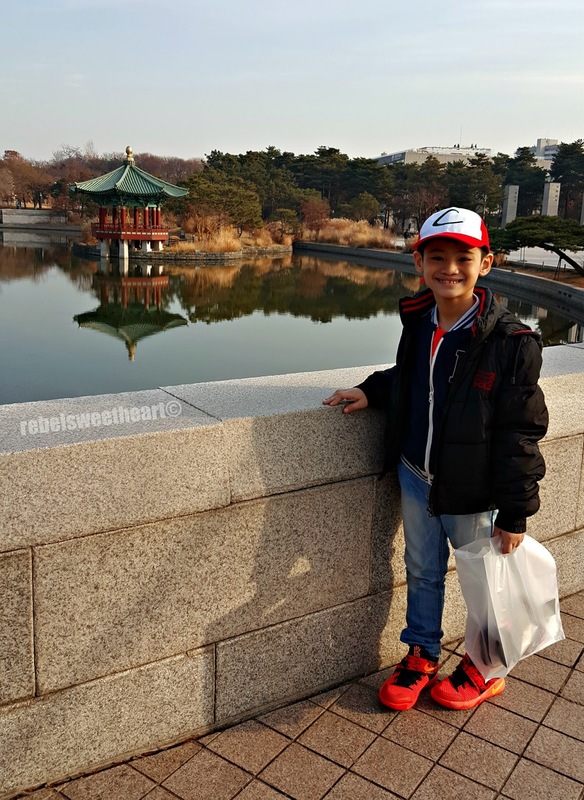 I haven't taken my kids out of the country. I guess it's because of the fear of not being able to handle two little kids while in a totally foreign place. But posts like this make me want to go and travel out of the country! Wow! 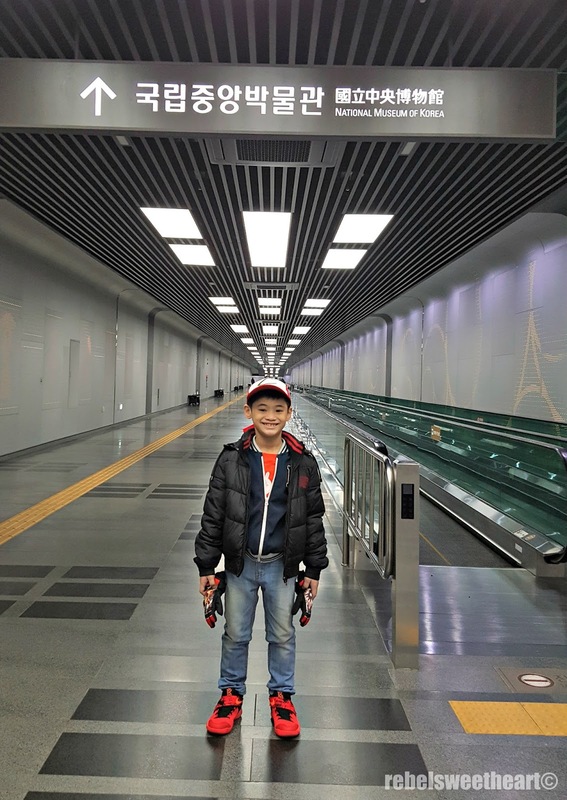 Looks like a nice museum to visit , sounds like you had a fun time there. LOL, love your blog title. 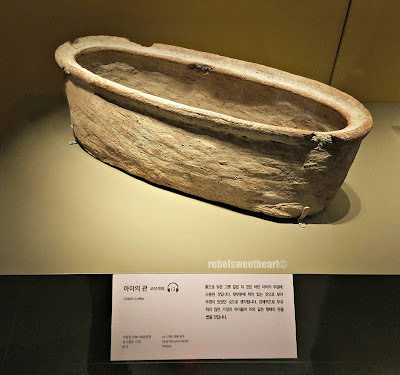 I haven't been to Korea yet but am adding this to my list. 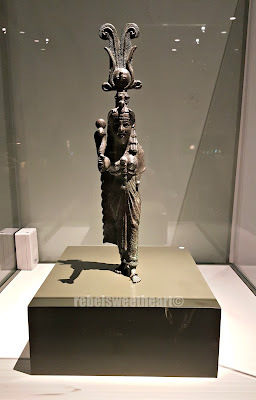 I've always been fascinated with Egypt! 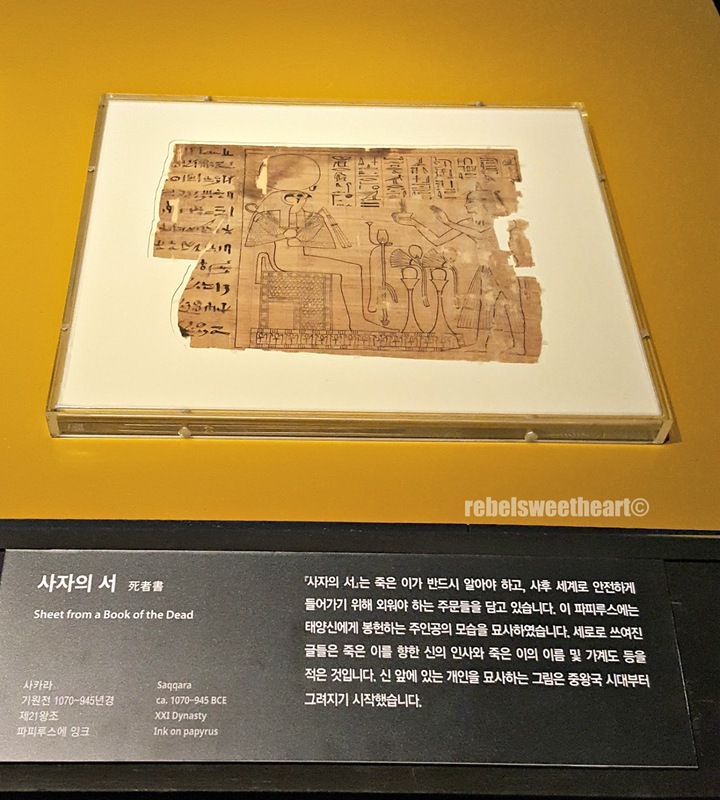 It's good to know that there's a museum in Korea that features Egyptian artifacts. 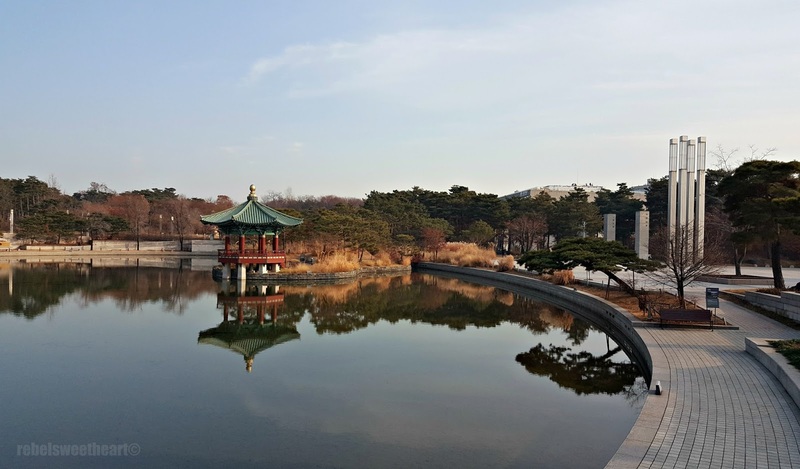 Wow, I never thought I would see another beautiful side of Korea. This time with splendid artifacts and sights from our friendly Egypt. You guys looked like you enjoyed it! What a great visit. 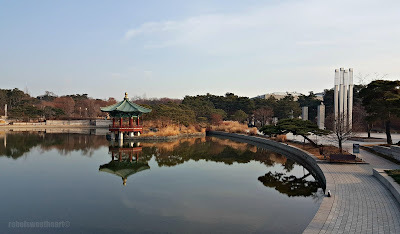 I do love that reflecting pond! What an awesome adventure! 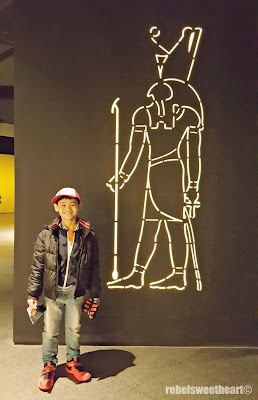 I love learning about ancient Egypt, it's one of the most fascinating subjects.